When out in nature, beware of crossing paths with these wild plants. Poison ivy - perhaps Canada's most infamous poisonous plant. Poisonous plants have chemicals that cause undesirable effects on humans and animals. These plants can cause toxic symptoms when ingested whereas others like poison ivy contain chemicals that cause inflammation of the skin when touched. While many of these plants are neat to look at, it is advisable not to touch them. 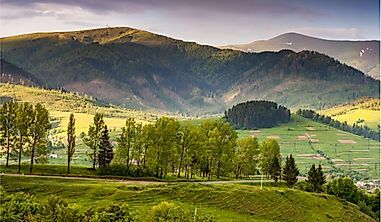 The "Canadian Poisonous Plants Information System" presents data on toxic plants that cause poisoning to animals and humans. The analysis below looks at ten common poisonous plants in Canada. Giant hogweed stands out for its extreme size. The giant hogweed is scientifically known as Heracleum mantegazzianum. The giant hogweed is native to Central Asia and naturalized in areas of Southern and Central Ontario. The giant hogweed plant grows to a height of approximately 2-5.5 m and resembles the common hogweed. The giant hogweed is a noxious weed as it is phototoxic. The sap of this plant contains furocoumarin chemical component, which causes phytophotodermatitis resulting to blisters, and long-lasting scars in humans. When touched, the skin turns red and begins to itch followed by the formation of blisters that last for 48 hours. After the disappearance of blisters, there is the creation of black scars that last for several years. Hospitalization in the case of contact with this plant is therefore necessary. 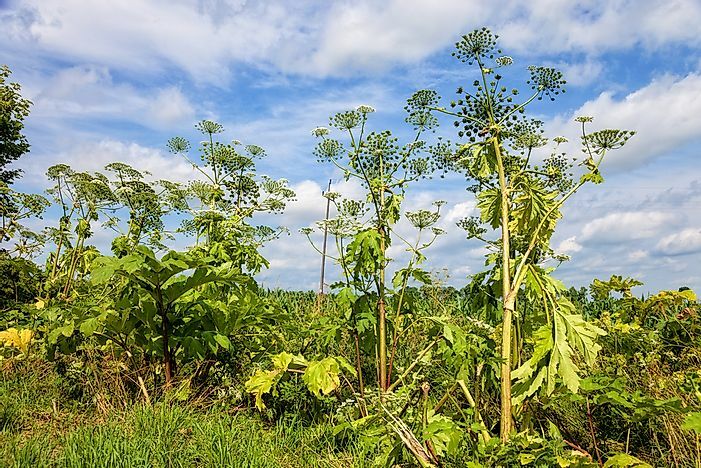 This harmful component is in the giant hogweed’s leaves, flowers, roots, seeds, and stems. 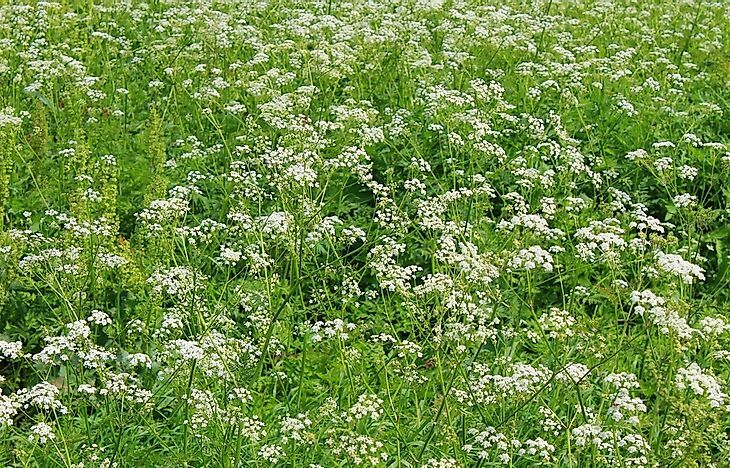 Water hemlock, scientifically known as the Cicuta, is a poisonous plant from Apiaceae family. They are perennial plants that grow to a height of about 2.5 meters. The water hemlock is native to the Northern Hemisphere in the temperate regions. Cicuta is one of the most poisonous plants on the continent as it contains cicutoxin, a toxic component that causes the stimulatory effects to the central nervous system leading to seizure when ingested. 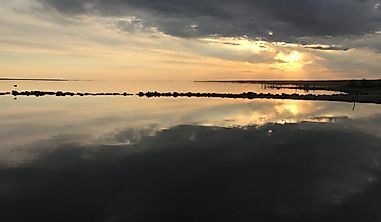 The poisoning caused by the water hemlock can be treated medically through the administration of activated charcoal that reduces the absorption of the toxic component. Elderberries growing on a bush. 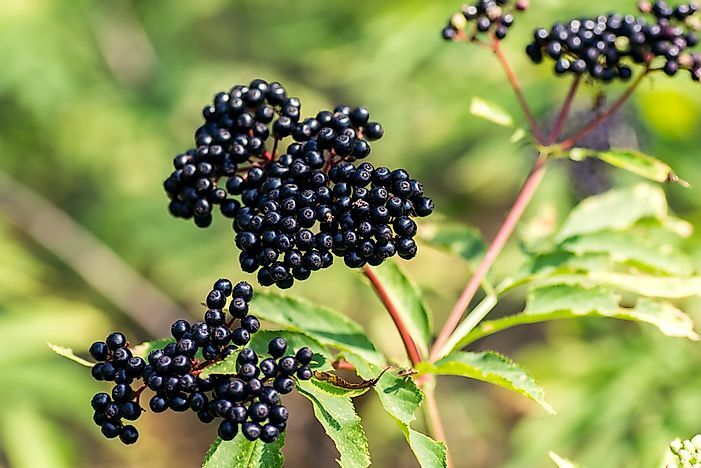 The elderberry, scientifically known as Sambucus, is a type of flowering plants that is widespread in the Northern and Southern Hemisphere in the temperate and subtropical regions. Most of its species are cultivated for their ornamental flowers, leaves, and fruits. Cooked berries of the elderberry are edible while uncooked berries, as well as other parts of this plant, are poisonous. Cyanidin glycoside contained in its leaves, roots, twigs, seeds, and branches cause illness when ingested in sufficient quantities. The winterberry, or llex verticillata, is a species native to eastern North America. This species grows majorly in wetlands but can also be found in sand dunes and grasslands. Numerous birds use the berries of this plant as food. However, when humans ingest the seeds, leaves, and barks of this plant, it causes nausea and low blood pressure. 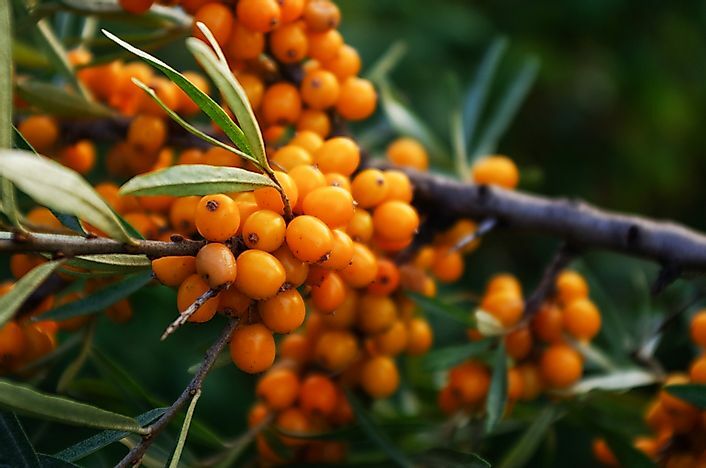 The buckthorn is a species of shrubs or small trees of a height ranging from 1-10 m and is native to North America, East Asia, and to the temperate and subtropical regions of the northern hemisphere. Some species of the blackthorn are evergreen while others are deciduous. 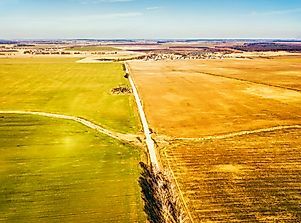 When ingested, the plant can cause chronic inflammatory demyelinating polyneuropathy (CIDP) which is an inflammatory disorder of the peripheral nervous system. Daphne is a genus of about 50 to 95 species of deciduous and evergreen shrubs that is commonly found worldwide. 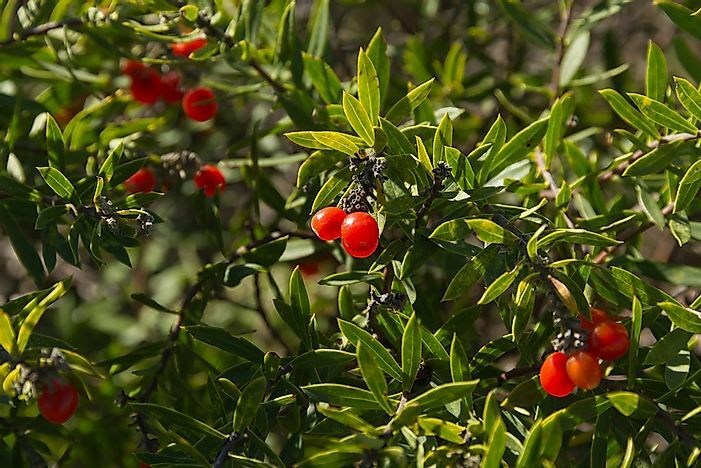 These plants are famous for their poisonous berries and scented flowers. Many species are cultivated as in gardens for their ornamental use. 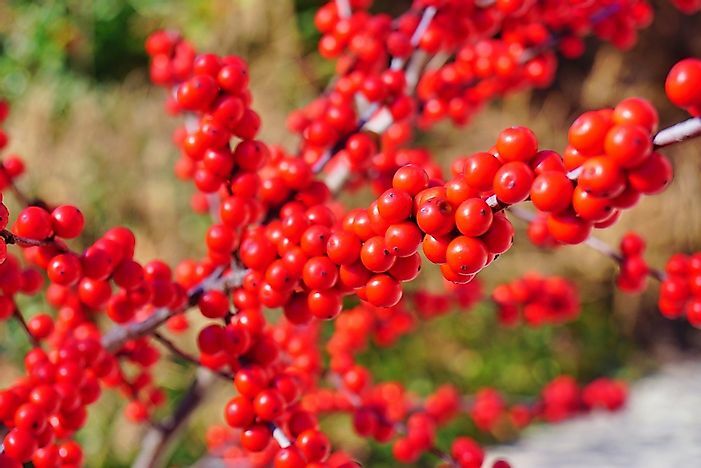 Their berries, bark, and sap contain toxins that cause skin irritation. Poison oak's distinctive leaf shape. The poison oak is a woody shrub mostly found in western North America. The twigs and leaves of this plant have oil on its surface that causes allergic reactions. 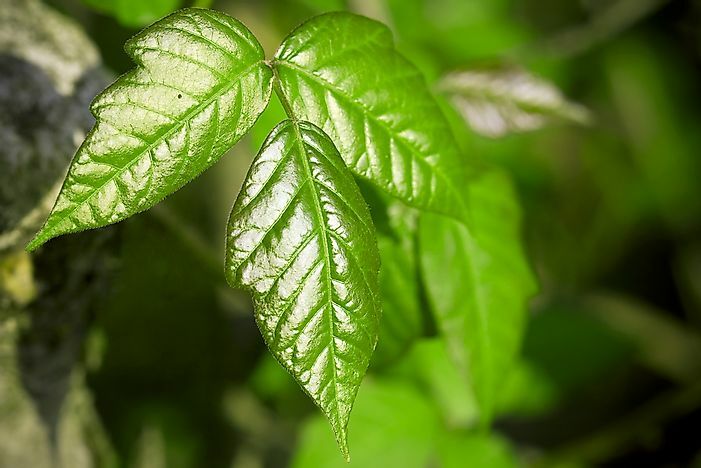 Contact with the leaves or the twigs of the poison oak causes itching that evolves to dermatitis causing inflammation and the formation of blisters. When burned, poison oak also emits poisonous smoke. 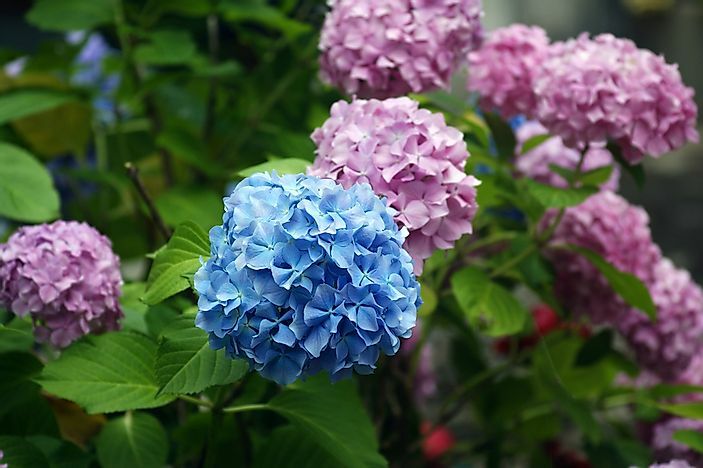 Hydrangea is also referred to as hortensia, and is a genus of about 70-75 species of flowering plants indigenous to Southern and Eastern Asia and the Americas. 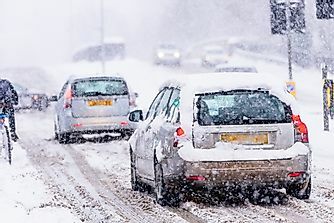 In Canada, the plant grows in warmer parts of the country. 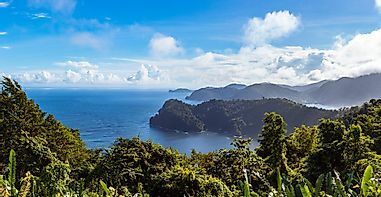 Some species are either deciduous or evergreen. Hydrangea is poisonous only when humans ingest their flowers buds. For sensitive people, they can develop dermatitis when in contact with this plant. Older reports also showed that the hydrangea poisoned cattle and horses. The poison ivy is a flowering plant native to North America and Asia. Poison ivy can be abundantly found in the southern section of the country. This plant has a clear liquid component known as urushiol in its sap. The element causes itching, skin irritation, and painful rashes to people who touch them. 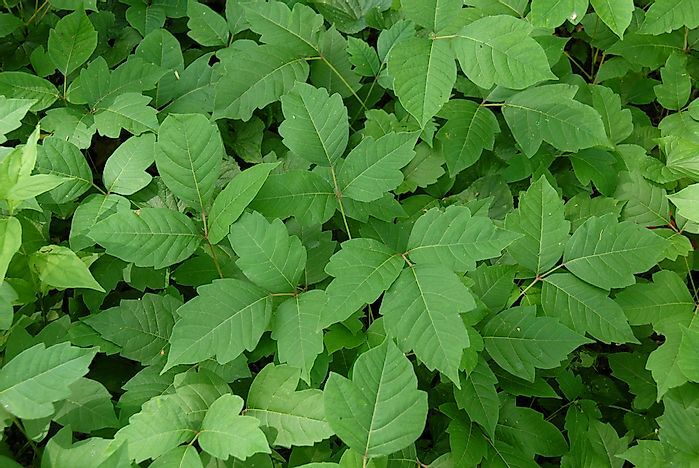 Many animals, as well as birds, eat the poison ivy but to humans, the plant is an unwelcome weed. When in contact with the poison ivy, you should immediately wash the surface with cold water and soap or rubbing alcohol, as this will prevent further reactions. One should be careful not to use hot water though as it opens pores in the skin leading to further admission of the oil. 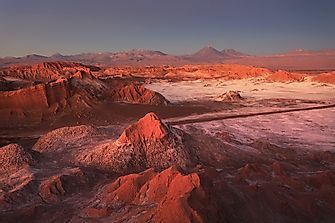 Calamine lotion can also be applied to mitigate its symptoms. The American Pokeweed is an herbaceous plant in the pokeweed family. The pokeweed grows to about 2 m in height. 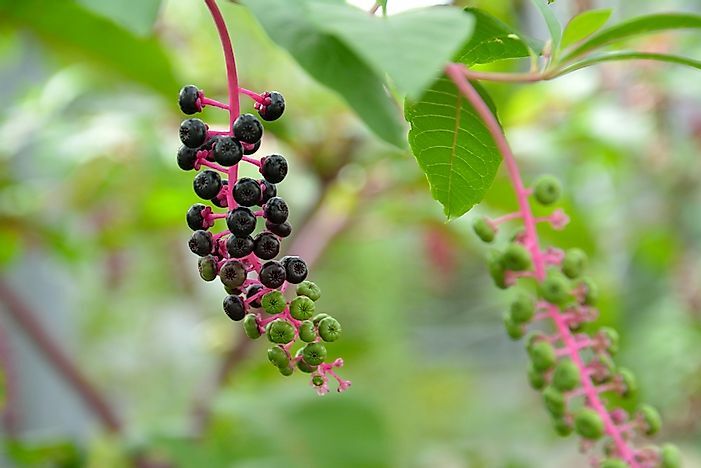 The American Pokeweed is native to the United States and Canada in Ontario and Quebec. This plant has berries that birds use as a food source. All parts of the American pokeweed are poisonous as they can cause vomiting, seizure, and convulsion. As the plant matures, the toxic level also increases and should be avoided during pregnancy and children should not consume even one berry. For sensitive people, the plant can cause dermatitis. Animals and birds are immune to the poison of this plant. In case it is taken accidentally, one should seek treatment or call a poison hotline.